The original Fujifilm’s batteries for X system camera are expensive. That’s the reason why there are so many alternatives available, but it also makes the choice of the right one tough. They not only vary in price and capacity, but some 3rd party batteries can even swell in camera and potentially damage it. This article tries to help with the right choice due to extensive testing of capacities and heat characteristics of several available brands. Each of the Fujifilm X-System cameras requires a NP-W126 or the newer NP-W126S battery for their operation. It’s definitely a good thing that people having multiple bodies don’t need multiple battery types and multiple chargers. This allows me to carry a backup X-M1 or X-T1 to my main X-T2 body while having just a single type of batteries. A little less exciting fact is that the original Fujifilm batteries are quite expensive, particularly considering their capacity and the price of similar Li-Ion batteries. Since you need quite few of them for real usage, it can cost quite a lot. Note that their capacity is considerably lower than a typical DSLR camera battery, while Fujifilm X-System cameras require much more power than a typical DSLR. NP-W126 is rated for 350 frames in X-T2 according to CIPA standard. Real life figure can certainly differ in both directions significantly. In case of long exposures in freezing temperatures you can expect much lower, but in case of continuous shooting it can easily be double of the specification or more. Note that in case of DSLR, the specs are usually in the range of 1000-1300 frames per battery. 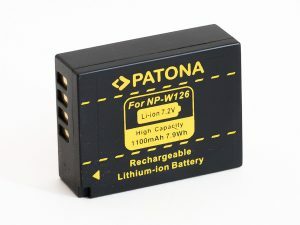 In 2016 Fujifilm introduced an updated version of the NP-W126 battery, with ‘S’ added to the title. This created quite a bit of confusion regarding its uses, advantages, etc. So, to clarify, both batteries share the same dimensions, contacts and power characteristics — both can deliver roughly 1200 mAh. They are interchangeable for any use in Fujifilm cameras as long as you don’t use power demanding features, which particularly means 4K video recording or an intensive continuous shooting. The NP-W126S is supposed to be thermally more efficient and thus able to better handle substantial loads. So, if this is your use-case, you’d probably be more inclined to purchase the NP-W126S over any aftermarket battery. However, according to my temperature measurements, there are several brands that are at least comparable to the original. An alternative for the original batteries are third-party ones that are available under many brands from most sellers, usually in the $15-$25 price range, but sometimes even lower than $10. However, are they at least as good as the original? Their description often claim rather unbelievable capacities (e.g. 1900mAh, the original has 1200mAh! ), while forum posts usually say that their capacity is lower than original. I decided to purchase few and measure by myself. I tested each battery in an external charger with discharging capabilities and a USB connection to a PC in order to plot the voltage curve (decrease of battery voltage during the discharge cycle). I set the discharge current to 500mA, since this is roughly what X-T2 needs when turned on. Apparently the cheapest aftermarket batteries fail pretty bad, but fortunately many brands offer pretty solid competitors to the original batteries. They often have almost the same capacities and also heat management under a heavy load seems to be alright. In order to better understand battery characteristics, I also include a chart of the voltage curve of each battery. Some batteries behave very similarly and often probably are just different brands for the very same product from some Chinese factory. For better clarity, such almost identical batteries are grouped in a single curve (>10 individual curves in the chart was simply a mess). The battery indicators in cameras are based on actual voltage of the battery. 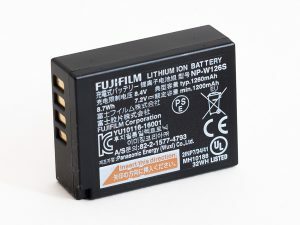 However, since the Fuji batteries have quite a different voltage curve, compared to all the aftermarket batteries, the remaining capacity shown by the camera isn’t accurate for non-Fuji batteries. This is mostly apparent on almost empty batteries — while the camera shows that the battery is still OK, it can actually be almost empty. While the indicator isn’t too useful for the original batteries, it’s next to useless for other batteries, where the in-camera indicator shows full battery for roughly 90% of the battery capacity! So, when it drops to 2 bars, you possibly won’t even finish a single longer exposure in freezing temperatures. Be warned! In order to confirm the claim that the new NP-W126S has better heat dissipating capabilities, I measured temperature of individual batteries in two tests: after 10 minutes of 4K video recording in X-T2 and after 15 minutes of 1.5A load in my (dis)charger. 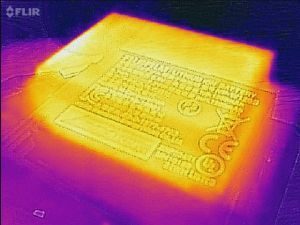 The results of both tests were similar, but the one made in camera seemed to be a little biased by the internal camera temperature and so the table above presents results from the second test. 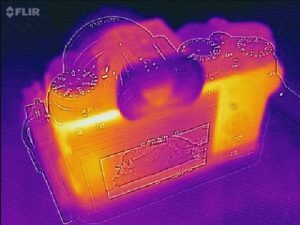 I also used my thermal camera, Flir One for Android (iOS version exists too), to capture batteries after a heavy load. 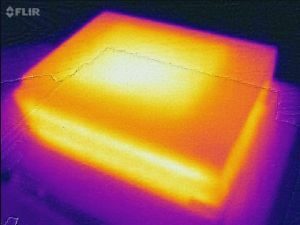 While the original battery shows mostly evenly distributed heat on its surface, the noname battery has much higher temperature in a smaller rectangle in the middle. This might be the reason for swelling of some batteries. I haven’t done any rigorous testing in this area, so far I’ve just tried to put all the brands to a fridge for few days, but haven’t measured any significant loss of charge. Even when not used for a long period, none of my batteries suffered any significant discharge. All the batteries lose their performance with time and usage. Their capacity decreases and the internal resistance increases. Don’t expect the very same performance from few years old batteries as you get from the new ones. My old original NP-W126 currently, after several years of usage, has roughly 1100 mAh, while it had >1200 mAh when new. Lower quality batteries can show more significant aging, the DSTE battery is already almost unusable. If you want the ultimate performance or you do a lot of 4K video recording or continuous shooting, NP-W126S is clearly the winner. That said, some of the third party batteries are very close to the Fujifilm’s original in performance, while they cost only a fraction of the price. Watson and Green Extreme have performance pretty much on par with the original batteries and cost roughly a third of them. They are currently available only the US. In Europe, there are very good Patona Premium, ExPro White and almost as good basic version of Patona available. All of them offer >90% capacity of the original batteries and also they don’t seem to produce significantly more heat even after some heavy use. By using these links you don’t pay more, but it supports this website. Thanks! I plan to update this page in the future, when I test other batteries. If you want to be notified about updates, just follow this website on Facebook or RSS. There are also other related articles published on this website, particularly about all the options for NP-W126 charging and measurements of the X-T2 power saving features. Update 04/04/2018: Added 5 more brands, redesigned tables and few other changes. Update 05/18/2017: Added ExPro White battery and temperature measurements for all batteries. Update 08/02/2017: Added Patona Premium.